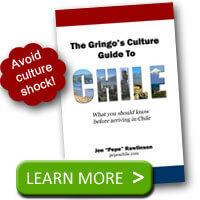 Chilean Empanadas are one of Chile’s most popular foods. 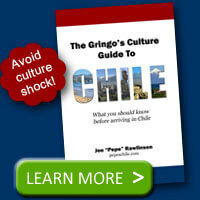 Empanadas have two parts: the outer dough shell and what is put in it, called el pino. 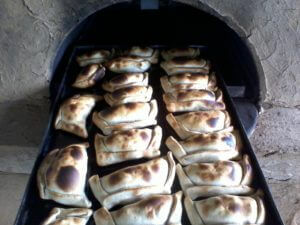 Here is a Chilean empanadas recipe with photos that my friend Sary and her mother sent to me. Chop the onions into cubes and reserve in a pot. Chop the meat into cubes and add in the same pot. While cooking these two ingredients add seasoning or cumin. Cook until onion is cooked through. Put the flour in a bowl or mixer. Open the center and shape it like a volcano. Add the oil, warm boiled water little by little. 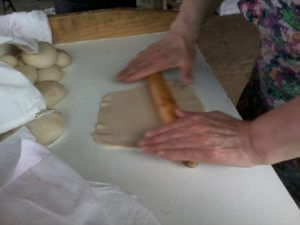 Begin to mix dough until it is smooth. After finishing the dough mixture, separate into little balls. 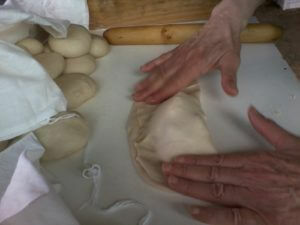 Use a rolling pin to smooth out the empanada dough flat. 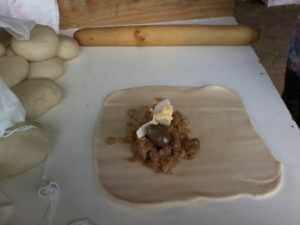 Smooth and flatten out the dough until it is big enough to hold the filling, a piece of hard boiled egg, and an olive. Once you put all the ingredients on the dough, fold over the shell in half. 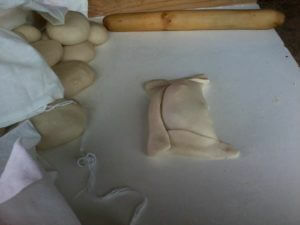 Fold up the edges of the empanada to completely enclose the filling. Preheat the oven to 175 degrees (80 degrees Celsius). Bake the empanadas until they are golden brown (about 20 to 30 minutes).